I’m continuing on with the Harry Potter party revisits today. 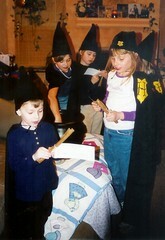 For our party, I chose to provide cloaks, hats and wands, all which came from Diagon Alley. Instead of going to Diagon Alley, our student’s packages were delivered “by owl” during the party! The children received a cloak, student hat, and cauldron when they enter the door, all wrapped in brown paper and string, with labels from the appropriate Diagon Alley stores: Ollivander’s, Madam Malkin’s, etc. Hem fabric at each end, making one of the hems wide enough to slide the elastic through. Add a Hogwarts or House crest to the left front of the cloak using the stencil. The crest can be stenciled, made of felt, painted, embroidered, or a printable iron on transfer. Commercially available patches are available from Whimsic Alley. Pull elastic through one of the hemmed ends, stitch together ends. Tack the two side of the fabric together so they will stay closed. Add decorative button on top. The children that attended our party were 5 – 10 years old. The cloaks were all approximately the same size, but I did ask for height measurements and made them to measure. On paper, trace around hat. Extend top to a point. Cut out template. 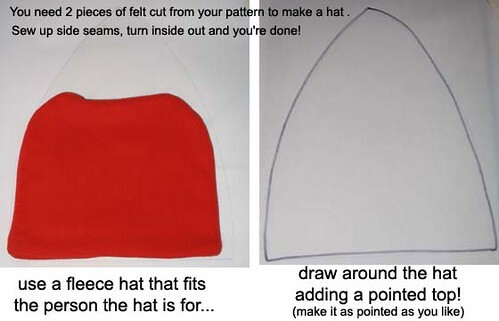 Cut out two pieces of felt in the same shape. Stitch, trim & turn inside out. Test the hat first, to make sure it fits before making the rest in case you need to make adjustments. Gently sand the dowels to make sure they’re smooth. Poke a holes into the bottom of the inverted egg carton. Inset the dowels into the holes. Paint each dowel a different color. When dry, flip and paint the other end. Repeat with sealant. Optional: before sanding, trim dowels to different lengths, sanding the rough edges off of the ends. Include wand names on an Ollivander’s label, printed on parchment and attached by string to the brown paper package. Cut and paste to make your own labels! The kids chose their wrapped wands from a cauldron , or rather their wands chose them! Each wand was unique, which made it easier for them to keep track of during the party. As always, if you make any pattern or craft from Sewhooked you can share your photos by adding them to the Sewhooked flickr group! 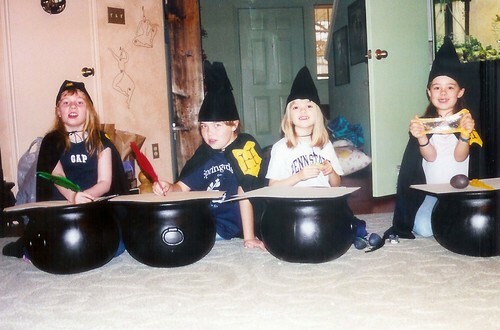 This entry was posted in hand crafts, harry potter, party ideas on February 24, 2009 by Jennifer Ofenstein.